For more than two-thousand years, maps have been used to try to help us make understand the world. As we tried to make sense of the range of campaign activities that made up the Scaling Improved Legumes Technologies (SILT) project in Tanzania, our project partners at Farm Radio (FRI) suggested we produce a map. These maps went live this week. The maps are a valuable resource for recording the complex relationships we have with different communities – to show how the multiple campaign elements have been built up in different locations. For example, someone in Babati district in Tanzania could encounter a comic in which the benefits of bean cultivation are discussed, hear some advice about best practices in a radio show, and visit a demonstration plot to learn more in person. Being able to visualise these interventions means that focused evaluation can more easily take place. It is possible to explore the places where different combinations of media have been available to farmers and see how uptake of technologies has varied with the different levels of exposure. In addition, the maps can help further campaign planning by showing how different communities have been sensitized. 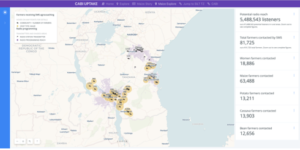 Inspired by the maps from the SILT, CABI has started to develop maps that reflect the different country campaign plans developed by the Africa Soil Health Consortium (ASHC) projects. 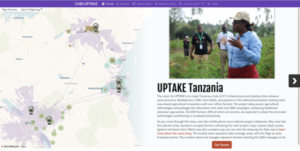 This has included a second campaign in Tanzania, also developed with Farm Radio, known as Upscaling Technologies in Agriculture through Knowledge and Extension (UPTAKE). CABI has also produced maps for the campaigns in Northern Ghana. Over two years some 300 village-based film screening have reached around 70,000 members of farming households with information on soybean farming and, in 2018, fall army worm was added to the screenings. CABI’s James Watiti explains: “In Ghana we are building up a lot of data about the village-based screenings and other key data, like the location of agro-dealerships. This will make it easy for us to think about the next steps in the soybean campaign as we explore options with different partners. They will also be shared publicly so that others are aware of the sensitization we have been carrying out with legume farmers and in relation to fall armyworm. A comprehensive effort to map campaign activity in this way could help to provide better information services to farmers.